"The nice part about a 24 hour event is that whatever you cover in that time period is what you get." Yes, it's nice if what you get is what you wanted in the first place! Unfortunately, neither our friend Joe nor I met our race goals at Hinson Lake but we will use that as a springboard to improve our training for upcoming races. Fortunately, Jim met his goals in this race and is in a good position as he continues training toward his big goal this year, the 48-hour race at Across the Years (ATY) in late December. 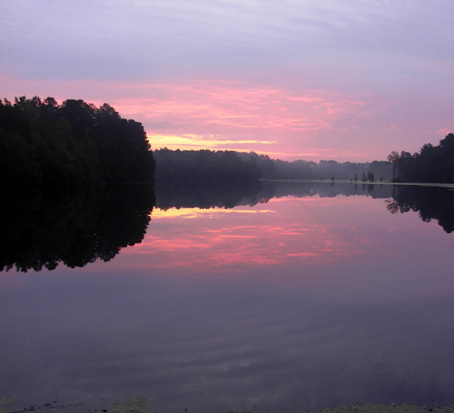 In this entry I'll analyze what went right and wrong for Jim and me at Hinson Lake. I'll try not to sound like I'm whining. I'm not; I'm just disappointed and need to do a self-critique to help me race better this weekend at the New River Trail 50K and continue training for my 24-hour race at ATY..
What can I say? Jim did great at Hinson Lake! He more than doubled the distance of any recent training run (from 30 to 71 miles). He felt good the whole time and he wasn't trashed afterwards, although he's been mostly resting the past week so he can start ramping up his training for Mountain Masochist this week. 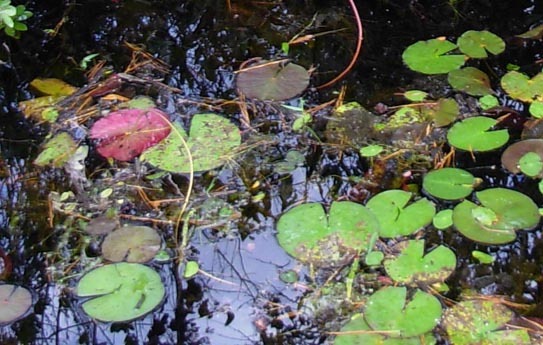 His stomach didn't bother him, he drank enough fluids to urinate regularly, and he consumed enough calories and electrolytes to maintain his energy. His experiment with napping during the night was also successful, and he returned to the course in the middle of the night with vim and vigor for almost five more hours of running and walking. 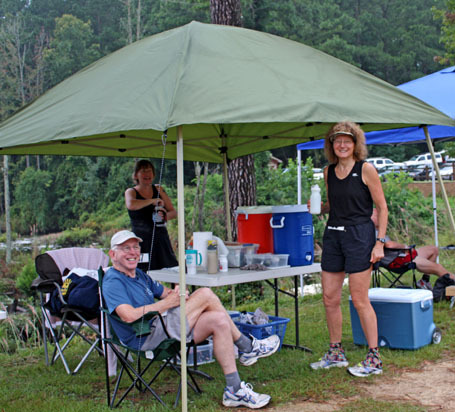 L-R: Jim, Lynn DiFiore, and Sue before the Hinson Lake 24-hour run. Photo by the Lugianos. Jim's only problem was a blister on his little toe the last couple laps. He'll work on that before Mountain Masochist and his other races (we both need to do more preventative taping). He thinks the more narrow Hardrock shoes that he wore in the middle of the race may have caused the problem. For most of the race he wore two pairs of wider Asics 2130 road shoes, and in retrospect realizes he should have just kept running in them. He's in the market for some wider trail shoes (probably the Asics 2130 trail version) to wear at Masochist, Ghost Town, and maybe Sunmart. 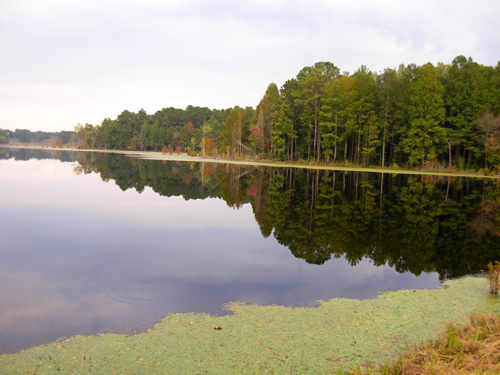 Jim ran and walked a fairly steady pace during the time he was on the Hinson Lake course (19� hours), averaging about 16:28 per mile for just under 71 miles, including stops. That does NOT include the time he was off the course from about 11 PM to 3:30 AM (4� hours). Over the entire 24-hour period of time, his pace averaged closer to 20:17 minutes per mile, including all of his stops at the canopy, potty breaks, time with Cody, and nap time. He'll try to increase that pace at Ultracentric in mid-November so he can get more miles there and work up to about 87 miles the first day at ATY in late December. It's all a gradual progression designed for a peak at ATY. I almost flunked that test. 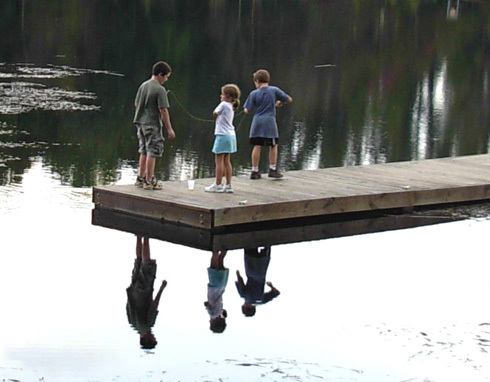 I had a lot more glitches at Hinson Lake than Jim. The good news is that I should be able to overcome most of them in my upcoming races. I'm one of those glass-half-full types, remember? Bottom line: I met my distance goal of 21 laps / almost 32 miles but I failed to run and walk it as fast (or comfortably) as I wanted. Instead of completing the distance in seven hours or less -- which I need to do this weekend at the New River Trail 50K in order to be an official finisher and get the nice technical shirt for which I've already paid in my entry fee -- I got only 27+ miles in that time. My pace and motivation deteriorated even farther the last 4+ miles and it took me a total of 8:40 hours to run 31.92 miles. I was aiming for an average 13:27 minutes per mile pace or faster, including all my stops, during the race. That's what I need at NRT 50K. I did that for only the first few miles, then had to start walking more because I just never found my running "groove." My legs felt dead and I just couldn't go any faster. I also killed an increasing amount of time because I mentally lost the desire to push myself. Reality was an average 15:44 pace for seven hours (27+ miles) and an average 16:17 pace for 8:40 hours (just under 32 miles). If the NRT 50K is indeed 31.2 miles, that won't cut it. If the race is longer, I'm in even more trouble. So what went wrong? Let me count the ways . . . and explain how I'll try to overcome them for my race this Saturday. I probably ran too hard during my training run on the New River Trail ten days before Hinson Lake (15� miles in 3:10 hours, a 12:33 pace -- and that included taking 87 photos!!!) and/or didn't taper sufficiently before the race. I had been pleased with the pace and feel of all my long training runs leading up to Hinson Lake and I felt fantastic down on the New River Trail. My dead legs were most likely a result of not tapering sufficiently for Hinson Lake. Because I considered Hinson Lake "just another training run," I deliberately didn't taper as much as I would for a "race effort." As I age I need to give my body additional time for recovery from efforts like these. Even though I cut back on my running mileage, effort, and weight work, I didn't cut back enough to accomplish my goal -- even for "just a training run." Lesson learned. My solution? 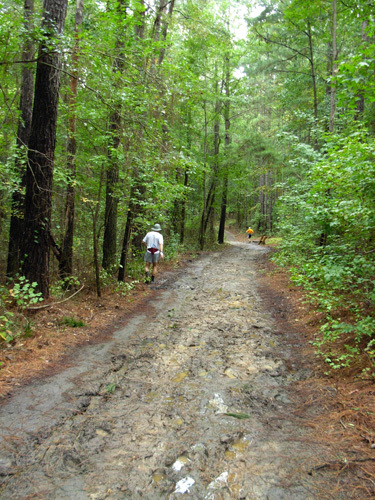 Cut back even more on mileage and weights during the two weeks between Hinson Lake and NRT 50K. I've been a slug (comparatively) for the first rest week. The hardest part is cutting back on calories to compensate for the reduced exercising! I may have gotten a deep-tissue massage too close to Hinson Lake, adding to the "dead leg" problem. I'll ask my massage therapist do lighter work during tomorrow's session, four days prior to the race. I'm also getting a chiropractic adjustment. Fortunately, after avoiding speed work for several weeks and getting deep tissue work done on my right leg several times, I've had no recurrence of the hip flexor / IT band pain I had in August and September. I didn't sleep well for several nights before the race. The heat and suffocating humidity during the Hinson Lake race definitely affected me. No matter how much of this weather I've run in in the past four months, I don't feel acclimated to it. I never did all the years I lived in the Atlanta area, either. Two immutable facts: I already train in this weather, and I can't control the weather at the New River Trail race. What I can control is how much fluids and electrolytes I take during the NRT race. Even though I felt like I was drinking adequate fluids at Hinson Lake when I stopped at our canopy every lap, I must have been significantly dehydrated because I didn't have to urinate for ten hours during and after the race. (That's happened in several 100-mile races before; it doesn't alarm me as much as it does Jim.) At NRT I'll avoid ibuprofen (not good for the kidneys during a race), drink more fluids (I'll be carrying two bottles with me so that will be easier), and take in more electrolytes. And I'll just cross my fingers for cooler, drier weather there! I think I managed calories OK during the race. I took in concentrated Perpetuem and Hammergel, chased down with water, every lap. The only other thing I drank while running was a small can of V-8. I ate a couple slices of orange while I ran but no other solid food until I quit. That should work at NRT also. The slope of the trail at Hinson Lake is a problem for me, and I'd forgotten that from last year. Huh? Let me explain about my weak left ankle and how it feels best for it to be on the high side of the trail . . .
Back in 2001 at Western States I ruptured both the peroneal (peroneus) brevis and longus tendons on the lateral side of my left ankle. Surgery didn't completely fix the problem, and that ankle turns outward quite easily on uneven trails, roots, and rocks. The very worst is when my left side is on the down side of a trail. I lean that direction, putting a lot of stress on that side of my body. So guess how at least half of the Hinson Lake loop is slanted when you go counter-clockwise in the race?? Yep, it's sloped down toward the lake, which is always on your left when you run CCW around it. So the majority of my weight was shifted to the left side of my body on that weak ankle and calf. By twenty miles, my left leg was getting numb. Nothing really hurt, and I wasn't cramping up like on some hot training runs, but it affected my whole body. In retrospect, I realize I should have worn an ASO ankle support on my left foot to stabilize it. I haven't been training in it much since spring; I don't run rough trails much any more so the supports weren't even on my mental radar screen. I don't believe this will be an issue on the New River Trail. 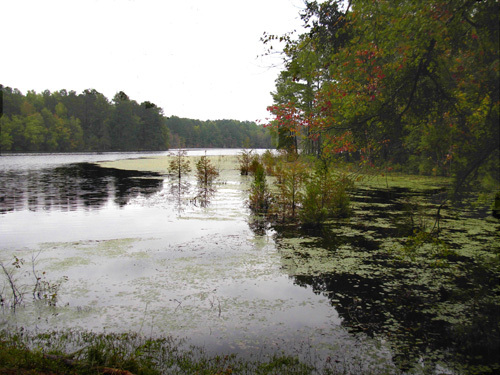 Although it follows a creek and a river, it isn't canted toward the water like the trail at Hinson Lake. 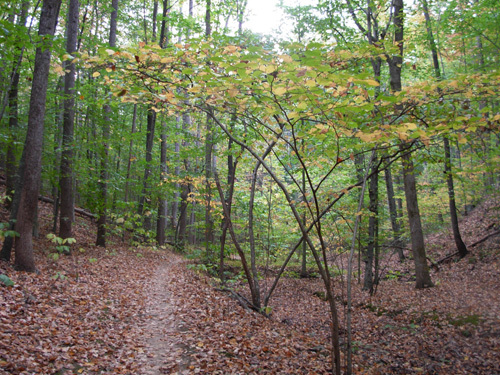 The trail is built on an old railroad bed and is a little higher in the middle than either side. Running on the right side out and back should be just right for my goofy ankle. The course at ATY isn't a problem either. It's pretty flat and we change directions every two hours. I was just plain stupid about blister prevention. I should not have gotten one of the two blisters that developed, and I lost some time with a sock adjustment, shoe change, and blister treatment. I wore fairly new Drymax socks which are touted by some of our ultra running friends as preventing blisters. I figured with all the filing down of calluses I've been doing on my feet, my new magic socks, and the wider Asics running shoes I've been wearing -- that I wouldn't need to tape or bandage two or three trouble spots I have. I was wrong. Changing into even wider shoes didn't help, and I finally had to put a bandage over a popped blister on one of my big toes. It was OK after that. I'll just bandage it and two other blister-prone areas before the NRT race, wear my wider shoes and trusty Injinji toe socks from the get-go, and carry a little blister kit with me just in case I still get a hot spot. The other blister was on my forefoot under thick skin. The same thing happened at ATY last year, except that time it was the other foot. I could pop this one after the race; the one at ATY was deeper and unreachable. Not sure how to combat this problem. I've done more harm than good when I try to file those under-foot calluses down with a PedEgg or pumice stone. I think more time on my feet to toughen them before ATY will be the key to prevention. I'm pleased with the shoes and inserts I'm wearing and believe they provide adequate cushioning. I shouldn't run into this problem as easily at New River Trail. It's a whole different format, more like the majority of ultras I've run over the years: an out-and-back course, not little loops; aid stations located 4-5 miles apart; a definite cut-off time to beat at the end. I won't be checking up on Cody (he'll be with Jim at the turn-around aid station, which he's captaining) and I won't carry my camera. I took time to enjoy the scenery and take lots of photos on my training run so I won't be tempted to do either during the race. My sole focus will be on maintaining steady forward progress, with few distractions. 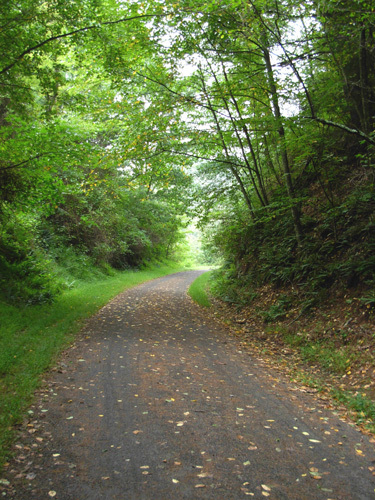 Trails don't get any better than the New River Trail for fast running! The closer the New River Trail race gets, the more optimistic I am about my chance of finishing within the seven-hour limit. It will still be a challenge, however, even if the weather is perfect, I am rested, and everything goes right during the race. I've still got to maintain a pace that's difficult for me for that distance. Jim is well enough rested eight days after Hinson Lake to gradually begin hill training for Mountain Masochist 50+++ mile trail run (MMTR) on November 1 (just under four weeks from now). He's had a quandary all summer: how to train optimally for his flat, smooth fixed-time races vs. this mountainous sucker that he's DNF'd the last two times. He needs not only adequate training on long, rough, hilly terrain, but also speed work to maximize the sections of the race where he can run a good pace (paved roads the first six miles and forest roads mixed in with rocky, rooty single-track trails the rest of the way). MMTR also poses a dilemma re: which shoes to wear. He'll need to taper for a couple weeks, leaving him only two more weeks of heavy training. Hopefully, he's recovered enough from Hinson Lake to do that. After MMTR, Jim can pretty much concentrate again on distance and steady pacing for the 48-hour race at ATY at the end of December. His races are close enough together, though, that he's mostly going to be recovering from one and tapering for the next! Two weeks after MMTR he's got the 24-hour race at Ultracentric, where he'll try to improve on the 71 miles he ran at Hinson Lake. Three weeks later is Sunmart (probably the 50K and not 50 miles). Three weeks and two days after that is ATY. Rolling trail at Explore Park. Photo taken 10-17-08. Both Ultracentric and Sunmart are training runs for ATY. We plan to use the same pacing at those that we'll do in the first 24 hours at ATY. We're considering the 50K at Sunmart instead of the 50-miler because of pace considerations. There is a 12-hour time limit for the 50-miler. We'd have to maintain an average pace of 14:24 minutes per mile to finish in an official time. That's significantly faster than Jim needs to be going at ATY on his first day to reach approximately 87 miles (16:55) or an average of 22 minutes per mile for about 130 miles in two days (19:12 to reach 150 miles, but he thinks that may be too optimistic). He can do any of those paces if he enters the 50K at Sunmart, which has a generous 11 hr. 30 minute cut-off. Then he could either keep going at the end of the race, unofficially, or do a double -- another longish run the next day on the same trails. It would make more sense for ME to run 50 miles in 12 hours at Sunmart because my goal at ATY is 50-52 miles in the first 12 hours, with a total of 90 miles in 24 hours. I need to be running a 14:24 pace or better anyway. However, the Sunmart course is hillier and rougher than ATY and I'm less likely to finish the 50-miler at Sunmart than at ATY. In addition, that much mileage 24 days before a 90-mile attempt at ATY may be too much for my body to recover adequately. So we're still thinking about which race to run at Sunmart! We'll have to decide before the entry fee increases on November 1. I'm not as busy with yard work right now. 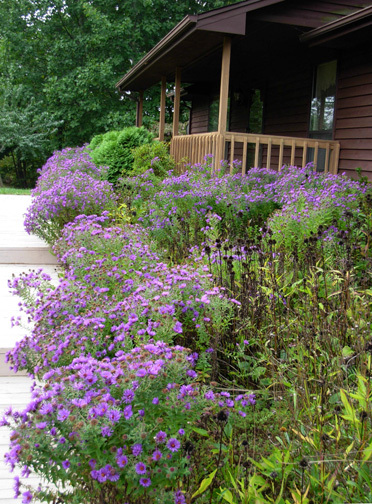 Asters are low-maintenance! My training plan through December is much simpler since I'm not doing any hilly races. I need to continue doing steady pacing for 10-20 minutes at a time, continue building up the time on my feet to 12 hours at Ultracentric and maybe Sunmart, and do at least one long run consisting of little 1/3-mile loops like I did last year for ATY. Now that I know I can tolerate dozens of little loops in a race, I don't feel the need to do as many long runs like that as I did last year. They do help with blister prevention, though. The feet are under more stress and abrasion when running around a track than moving forward in more of a straight line. Fortunately, at ATY we switch directions every two hours. I don't think we will at Ultracentric; there are too many races going on simultaneously. I have five weeks between the New River Trail 50K and Ultracentric 12-hour run. During that time I'm aiming to do a "long double" run (i.e., a moderately long run on one day and another the next day) that totals about 10 hours and a long single run of 9-10 hours on the slightly rolling Wolf Creek Greenway. 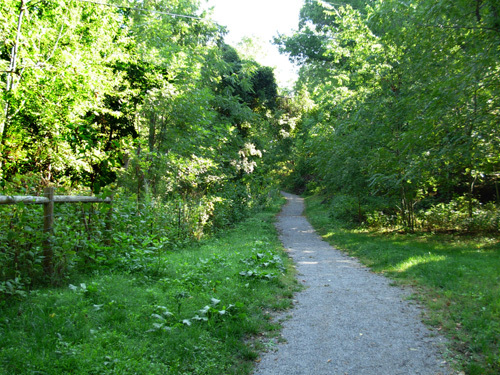 One or both of the double runs could be our 1/3-mile loop course on the greeneway. My only other long training runs before ATY will be Ultracentric and Sunmart. We have our work cut out for us, don't we?? This past Saturday we had fun volunteering overnight at the inaugural Grindstone 100-miler in the mountains of the George Washington National Forest west of Staunton, VA. We wanted to help and and visit friends. 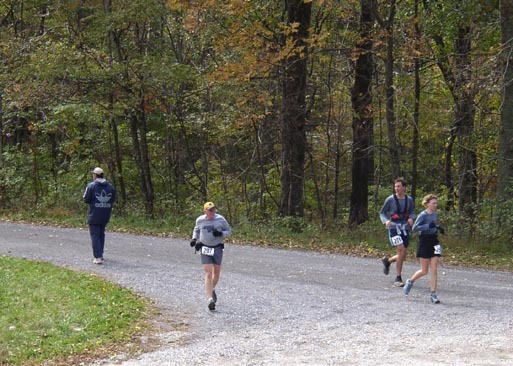 Several of our friends were bravely running the brand new race, which has enough elevation gain and rough terrain to warrant a 38-hour time limit (two hours longer than the nearby Massanutten 100-miler, notorious for its rocks). A high enough percentage of the runners (62 of 74) finished within the time limit that Jim and I are fearful that race director Clark Zealand may lower the time limit next year! Jim regrets not entering this year. If it was a Hardrock qualifier, he would have entered. But the Hardrock committee hasn't made that decision yet; they wanted to see how the first-time race went. Jim (far right) walks toward the lodge at Camp Shenandoah, the start/finish area of the Grindstone 100. It was a two-hour drive from our home to the race start-finish at Camp Shenandoah, a Boy Scout camp in the scenic Shenandoah Valley. We stopped there about 6 PM to see if Clark had any supplies he wanted us to take to the Falls Hollow aid station where we were assigned for the night. The race had begun at 6 PM on Friday; after 24 hours, nine of the 74 starters had already finished the race. It was a winding, hilly drive to our aid station at the intersection of FSR 291 and busy VA 42. Falls Hollow is the first and last aid station on the out-and-back course (5.7 miles outbound and 95 miles on the return). We worked with several other volunteers off and on from about 7 PM to 6 AM, after the last runners cleared our station and headed for the finish line. 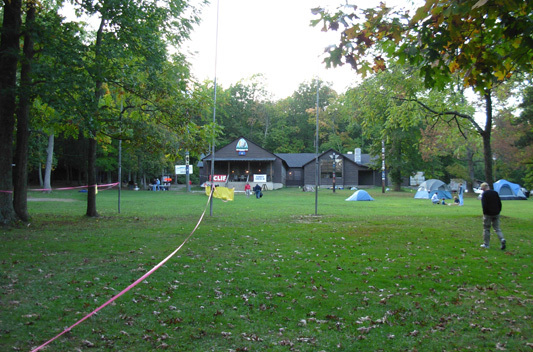 The final cut-off at Camp Shenandoah was 8 AM. Jim (navy jacket, kneeling left) gets runner Trey Barnes (hands on knees) some warm soup at Mile 95. We missed the next five or six runners in transit to the aid station but saw most of our friends who were in the first half of the pack: David Snipes, Kerry Owens, Sophie Speidel, Regis Shivers, Jr., Vickie Kendall, Jay Finkle, and Mike Dobies. 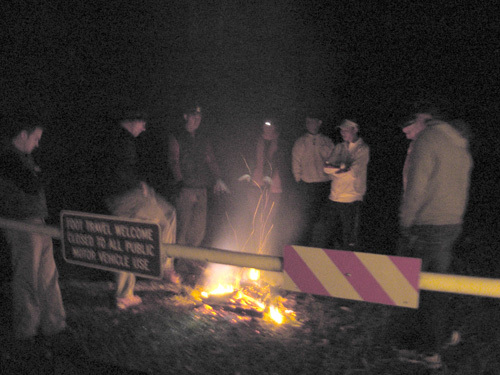 That fire was highly appreciated by both volunteers and runners alike! The race saw perfect running and pacing weather -- warm and dry all weekend -- but it was chilly during the night for crews and volunteers who weren't moving around as much. We had to make sure none of the runners stayed too long by the inviting fire. Beware the chair. Runners were few and far between from midnight to 6 AM. There was a lot of down time to talk, doze, or read. Jim and I got a break for a couple hours during the night to sleep but that was pretty unlikely to happen right next to the aid station! 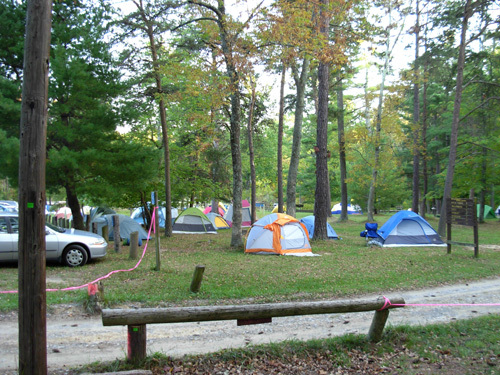 Lots of runners slept at Camp Shenandoah after finishing their run. Cody stayed in the van except for several forays up the trail with Jim and me to meet and greet incoming runners. While I was trying to sleep, one of the young male volunteers tapped on the window to get Cody's attention, then opened the sliding door and sat down to cuddle with the warm, furry dog. It was all I could do to not giggle; the volunteer didn't realize I was lying on the back seat. After about a minute I slowly moved the blanket away from my face and said, "Hello!" surprising the heck out of him. Too bad I couldn't see his face very well! He was very apologetic. No problem -- I couldn't sleep anyway, and I thought it was pretty darn funny. After the last runner came through we took down the aid station. Jim and I were tired enough that we drove on home instead of staying another 2� hours for the awards breakfast back at Camp Shenandoah. We haven't seen any race reports yet but e-mails from some friends indicate they really enjoyed this new race, which is part of Clark Zealand's and David Horton's "Beast Series" of races in Virginia. We're glad we could be a small part of the event as volunteers. 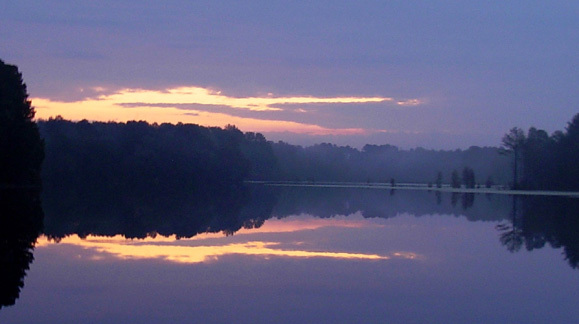 Next entry: the New River Trail 50K -- what a pretty venue!